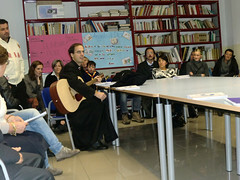 A group of adults of the Home of the Mother began in May and they were really looking forward to meeting Fr. Rafael, as they had only seen him once here and had not really had the opportunity to get to know him personally. We began with the usual girls' group meeting we have on Saturdays. Father spoke to them a bit and thus, they were able to meet him and get to know him. Later on, at 8 pm, we had Mass in our chapel. At first, the Mass was only going to be for the community here, but in the end there were actually a quite a bit of people by the time the word spread. We did our best to make room for everyone, as the chapel is really quite small. The next day, Sunday, we had a retreat with all the members of the Home. It began at 9:30 am with the Children's Mass in the parish, which we all attended. After the Mass, we had a Holy Hour with the Blessed Sacrament exposed in the parish, led by Fr. Rafael. After this, we watched the new film on the Missionary Groups of the Home of the Mother. Then, we had lunch. The adults had already taken care of coordinating the food and preparing everything in the parish kitchen. Once the lunch was over, we had a meeting with everyone to talk about the Home. Everyone was really grateful for the discussion. There were a total of about 25 adults, in addition to the boys who went with Brother Jose Luis and the girls who were with a few Sisters. Thanks be to God, the adults group of the Home in Lumezzane continues growing. 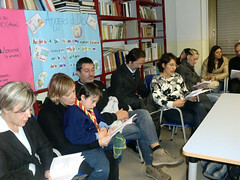 There are now also several adults from Milan that come to the meetings and activities.